Beaches, Boats, & Birdlife in Abundance - Recently Remodeled!! Now booking for APRIL! Ask about our specials! Our total remodeling project is still looking brand new! 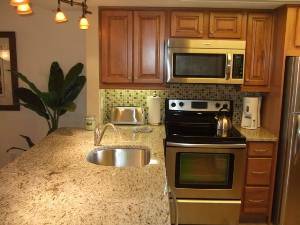 Fabulous redesigned kitchen with new appliances, more wood cabinets, and granite counter tops with bar! Formal dining table for six. Stunning new bathrooms! Fresh new lighting, tile, carpet, windows, doors, trim, paint, furniture, and decor throughout! 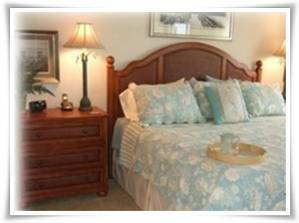 Newly designed master bedroom closet and extra utility closet to store beach chairs, fishing poles, and all the other extras we provide. Check out the new photos and more info by clicking on our link in the Links Section (Above the Property Photos section near the bottom of the page). VIEWS ARE SUPERB FROM THIS PENTHOUSE-FLOOR BEACH CONDO! Looking out your 6th floor lanai window you won't be able to see a single building obstructing your view of lush Lover's Key State Park to the south, endless azure seas to the west, or pristine white beaches stretching off into the distance along the coast. Watch the day unfold from sunrise to sunset while you enjoy the warm tropical breeze from your chair. You might even see the sailors' fabled green flash as the sun melts slowly into the shimmering gulf beneath you. While you stroll this huge, gorgeous beach, you likely will see Dolphins, Manatees, Pelicans and dozens of shore birds. We provide beach towels, chairs, picnic ware and toys! Bring your fishing poles and catch Grouper, Snook, Sharks and more from the shore or bridge at Big Carlos Pass. Fort Myers Beach is home to the renowned Shrimp fishing fleet. Enjoy fresh catches daily. Indulge yourself with fabulous tastes from local restaurants, grill-out or picnic on the beachfront. Our kitchen has everything you need should you just want to cozy up and dine "at home". Kayak or boat to Mound Key, an archaeological treasure built as the Calusa Indian's headquarters over one thousand years ago. Stroll through the Matanzas Pass Nature Preserve and enjoy Florida's flora, fauna, and bird life in its primitive state. Walk to Lover's Key State Park for kayaking, shelling, and picnics. Ride the Beach Trolley from one end of the island to the other. An excellent public library is nearby as well as movie theater, fine restaurants, entertainment, and shopping. Times Square boasts of live nightly performances and outdoor dining. This could be your best vacation yet! FREE WIFI is now available not only in the downstairs lobby but also in our unit. 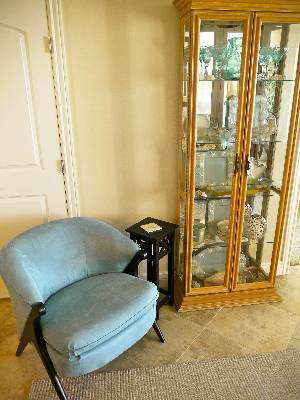 Enjoy the comforts of home while using the internet 24 hours a day. 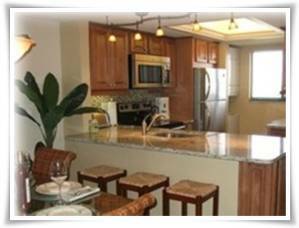 Our LIVING AREA features a 42 inch flat screen HDTV so you can watch even while preparing meals in the kitchen. Relax on our comfy sofa/sleeper or stretch out in the new leather recliner. Listen to a CD from our music library or read a book from our shelves. Our well stocked KITCHEN provides many extras! Two complete sets of dishes, casual and formal glassware, outdoor picnic supplies, most utensils you would ever need, waffle maker, electric pancake griddle, crock pot, blender, coffee maker, bar set, new pans and so much more! Our formal DINING AREA features a glass top wicker table for six plus seating for three at the bar. Beautiful tile floors are softened with area rugs except in the bedrooms where there is plush wall-to-wall carpet. Our sofa (which converts to a queen size bed), comfy leather ottoman, and new leather recliner are all perfect for reading, relaxing, or viewing TV. The MASTER BEDROOM has two matching chests with reading lights on either side of the king sized bed plus a hand painted storage cabinet on which the flat screen TV sits. The completely new master bath features a luxurious shower, many cabinets, and granite counter top. The GUEST ROOM is cozy and casual with its own TV, natural wicker double dresser, nightstand, and headboards and soft comforters on new twin beds. The totally remodeled bath has a tile shower and also a large linen closet. NEW wicker style lanai furniture including dining for 4 and a comfy chaise lounge. NEW Tommy Bahama Beach Cart to carry chairs, umbrellas, towels, sand toys, and cooler across our huge beach. We supply all of the above! The cart folds for easy storage in our walk-in closet. We have books to read, games to play, music to enjoy, and everything you need for a great time! The lanai opens to the master bedroom and living area. Nothing made by human hands is visible! A table, four chairs, and a chaise lounge make this an inviting spot to watch the beach. All new kitchen has stainless appliances, washer/dryer, two large granite counters, and an extra bank of cabinets and drawers. Tile floors throughout main living area. 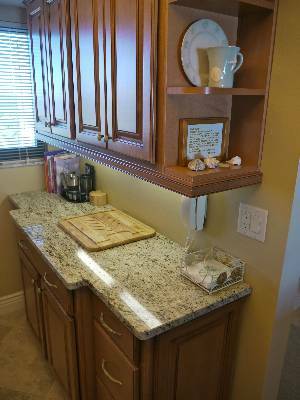 Another extra in our remodeled unit is this larger cabinet with more granite counter space. Under cabinet lighting makes it ideal for preparing meals. This glass-topped table with padded wicker chairs is perfect for sandwiches or an elegant dinner. You'll find two complete sets of dishes and beautiful glassware as well as casual picnic ware. This new queen sofa sleeper and leather recliner are just what you need for watching TV, reading, or visiting. Leather ottoman is comfortable and lightweight for when you need to make up the bed. New king bed with matching chests on both sides, plush carpet, and hand-painted cabinet with flat screen TV! Soft gauzy draperies and quilted bed linens add to the charm. 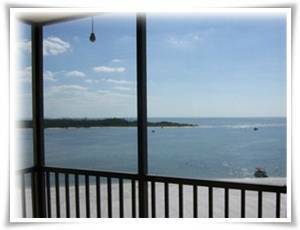 We love the view of the gulf and Lover's Key from the lanai...almost as much as the newly remodeled interior and beautiful furnishings. If you are looking for a condo with a spectacular view, homey, comfortable, quiet, with elegant decor, look no further. This condo has it all! I have traveled extensively over 25 yrs and stayed in many hotels and condos but this one ranks the best. 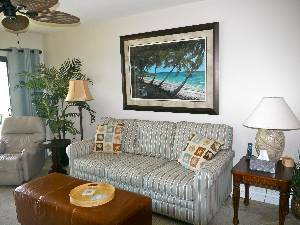 Although busy during the day, nothing was better than to walk the beach, which is right out the front door, and relax on the lanai in the evening and watch a beautiful sunset. Thanks Bonnie and Kathleen for the detail, upgrades, and furnishings that make this condo so comfortable. Had a great time and the golf was good, too! Without a doubt, will be returning. Thanks again! This was our first experience renting on a vacation. We had always stayed in hotels. The time we spent at Carlos Pointe was wonderful! We felt like we were in a cozy home. Bonnie and her family were very kind and professional. 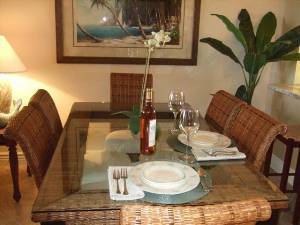 The condo is tastefully decorated and updated. Everything is clean and well kept. It was nice to have a kitchen and laundry. The view of the beach is fantastic. The building was quiet which is what we wanted for spring break. We loved the area and travel from the condo was easy. My 11 year old loved the pool which faces the Gulf. My 13 year old loved the beach area and playing ping pong in the rec area, at the condo. Our family felt very safe, the beach area is also private. We would recommend this condo to anyone!! Thanks, Bonnie! Last Minute Discounts! Loyalty Discounts! DISCOUNTS ON STAYS LONGER THAN 2 WEEKS! WE WILL WORK WITH YOU TO MAKE THIS VACATION POSSIBLE!